Tetralogy of Fallot (TOF) is a form of congenital heart disease that affects about five of every 10,000 babies, accounting for about 10 percent of all congenital heart disease. While TOF is always a significant problem that requires surgical treatment, its severity can vary quite a bit. Sometimes it produces immediate life-threatening symptoms in the newborn, and requires urgent treatment. In other cases, TOF may not produce significant symptoms (and it may remain undiagnosed) for several years. But sooner or later, TOF always causes life-threatening cardiac problems, and requires surgical repair. Medical students often make the mistake of trying to understand TOF by memorizing this list of four defects. While doing so may help them answer test questions, it doesn’t help them very much in understanding how TOF works, or why people with TOF have so much variability in their symptoms. To “get” TOF, it is helpful first to review how the heart normally works. (Read here about the heart’s chambers and valves.) Oxygen-poor, “used” blood from all over the body returns to the heart through the veins, and enters the right atrium, and then the right ventricle. The right ventricle pumps the blood through the pulmonary artery to the lungs, where it is replenished with oxygen. The now-oxygenated blood returns to the heart through the pulmonary veins and enters the left atrium, and then the left ventricle. The left ventricle (the main pumping chamber) then pumps the oxygenated blood into the main artery (the aorta) and out to the body. Also keep in mind that normally, the right and left ventricles are separated from one another by a muscular wall called the ventricular septum. To understand TOF, you really need to understand only two (not four) important features of this condition. First, a large portion of the ventricular septum is missing in TOF (a so-called ventricular septal defect). The result of this septal defect is that the right and left ventricles no longer behave as two separate chambers; instead, they function to a certain extent as one large ventricle. Oxygen-poor blood returning from the body, and oxygen-rich blood returning from the lungs, mix together in this ventricle. Second, because functionally there really is only one large ventricle, when that ventricle contracts, the pulmonary artery and the aorta are essentially “competing” for blood flow. And because in TOF there is a certain amount of stenosis (narrowing) of the pulmonary artery, the aorta usually receives more than its share. If you’ve stayed with the explanation this far, it should make sense to you that the key to TOF is the degree of stenosis present in the pulmonary artery. If there is a large degree of pulmonary artery obstruction, then when the “single” ventricle contracts, a large portion of the pumped blood will enter the aorta, and relatively little will enter the pulmonary artery. This means that relatively little blood gets to the lungs and becomes oxygenated; the circulating blood is then oxygen-poor, a dangerous condition known as cyanosis. So, the most severe cases of TOF are those in which pulmonary artery stenosis is the greatest. If pulmonary artery stenosis is not very severe, then a reasonable amount of blood gets pumped to the lungs and becomes oxygenated. These individuals have much less cyanosis, and the presence of TOF may be missed at birth. A well-described feature of TOF, seen in many children with this condition, is that the degree of pulmonary artery stenosis may fluctuate. In these cases, cyanosis may come and go. Cyanotic episodes may occur, for instance, when a baby with TOF becomes agitated or begins crying, or when an older child with TOF exercises. These “spells” of cyanosis are often called “tet spells” or hypercyanotic spells. These spells of cyanosis may become quite severe, and can require emergency medical treatment. The symptoms largely depend, as we have seen, on the degree of obstruction present in the pulmonary artery. When fixed pulmonary artery obstruction is severe, profound cyanosis is seen in the newborn (a condition that used to be called a “blue baby”). These infants have immediate and severe distress, and require urgent treatment. Children who have moderate obstruction of the pulmonary artery are often diagnosed at a later time. The doctor may hear a heart murmur and order tests; or the parents might notice hypercyanotic spells when the child becomes agitated. Other symptoms of TOF may include difficulty feeding, failure to develop normally, and dyspnea. Older children with TOF often learn to squat to reduce their symptoms. Squatting increases resistance in the blood vessels, which has the effect of causing resistance to blood flow in the aorta, thus directing more of the cardiac blood into the pulmonary circulation. This reduces cyanosis in people with TOF. Sometimes children with TOF are first diagnosed when their parents mention their frequent squatting to a doctor. The symptoms of TOF—cyanosis, poor exercise tolerance, fatigue, and dyspnea—tend to worsen as time goes by. In the large majority of people with TOF, the diagnosis is made during early childhood even if it is not recognized at birth. In people whose TOF includes only minor pulmonary artery stenosis, spells of cyanosis may not occur at all, and years may pass before a diagnosis is made. Sometimes, TOF may not be diagnosed until adulthood. Despite the lack of severe cyanosis, these people still need to be treated, since they often develop significant heart failure by early adulthood. As is the case with most forms of congenital heart disease, the cause of TOF is not known. TOF occurs with higher frequency in children with Down syndrome and with certain other genetic abnormalities. However, the appearance of TOF is almost always sporadic in nature and is not inherited. TOF has also been associated with maternal rubella, poor maternal nutrition or alcohol use, and a maternal age of 40 years or more. Most of the time, however, none of these risk factors are present when a baby is born with TOF. Once a cardiac problem is suspected, the diagnosis of TOF can be made with an echocardiogram or a cardiac MRI, either of which will reveal the abnormal cardiac anatomy. A cardiac catheterization is also often helpful in clarifying the cardiac anatomy prior to surgical repair. The treatment of TOF is surgical. Current practice is to perform corrective surgery during the first year of life, ideally between three and six months of age. “Corrective surgery” in TOF means closing the ventricular septal defect (thus separating the right side of the heart from the left side of the heart) and relieving the pulmonary artery obstruction. If these two things can be accomplished, blood flow through the heart can be largely normalized. 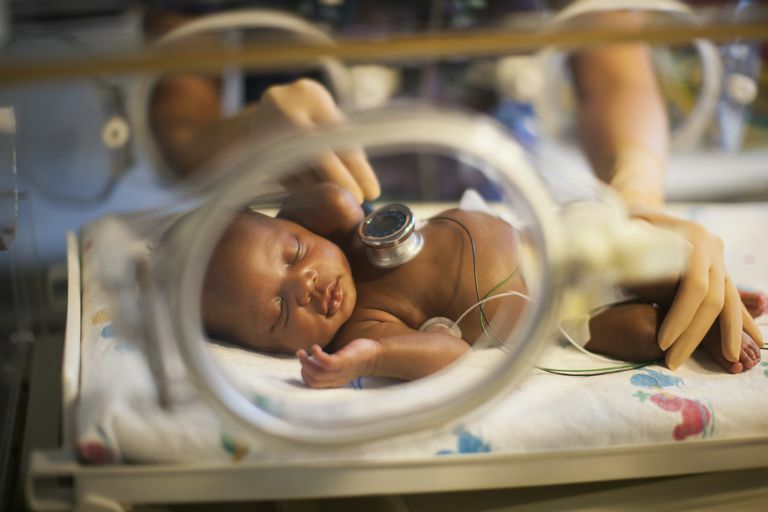 In cases where significant distress is present at birth, a form of palliative surgery may have to be performed, to stabilize the baby until he or she is strong enough for corrective surgery. Palliative surgery generally involves creating a shunt between one of the systemic arteries (usually a subclavian artery) and one of the pulmonary arteries, to restore a certain amount of blood circulation to the lungs. In older individuals diagnosed with TOF, corrective surgery is also recommended, although the surgical risk is higher in older people than in young children. With modern techniques, corrective surgery for TOF can be performed with a mortality risk of only 0 to 3 percent in infants and children. The surgical mortality rate for TOF repair in adults, however, can be higher than 10 precent. Fortunately it is very uncommon for TOF to be “missed” today into adulthood. What Is the Long-Term Outcome of Tetralogy of Fallot? Without surgical repair, almost half of people with TOF die within a few years of birth, and very few (even those with “milder” forms of the defect) live to be 30. After early corrective surgery, long-term survival is now excellent. The large majority of people with corrected TOF survive well into adulthood. Because modern surgical techniques are only a few decades old, we still do not know what their ultimate average survival will be. But it is becoming common for cardiologists to see patients with TOF in their sixth and even seventh decades of life. Still, cardiac problems are fairly common in adults with repaired TOF. Pulmonary valve regurgitation, heart failure, and cardiac arrhythmias (especially atrial tachycardia and ventricular tachycardia) are the most frequent problems that occur as the years go by. For this reason, anyone who has had corrected TOF needs to be under the care of a cardiologist who can evaluate them regularly, so that any cardiac problems that subsequently develop can be dealt with aggressively. With modern treatment, tetralogy of Fallot has been transformed from a congenital heart condition that usually resulted in death during childhood, to a largely correctable problem that, with good and continuous medical care, is compatible with living at least until late adulthood. Today, parents of babies born with this condition have every reason to expect to experience much the same kinds of happiness and heartbreak they might expect with any other child. Khairy P, Aboulhosn J, Gurvitz MZ, et al. Arrhythmia Burden in Adults with Rurgically repaired Tetralogy of Fallot: a Multi-institutional Study. Circulation 2010; 122:868. Park CS, Lee JR, Lim HG, et al. The Long-term Result of Total Repair for Tetralogy of Fallot. Eur J Cardiothorac Surg 2010; 38:311. Warnes CA, Williams RG, Bashore TM, et al. ACC/AHA 2008 Guidelines for the Management of Adults with Congenital Heart Disease: a Report of the American College of Cardiology/American Heart Association Task Force on Practice Guidelines (Writing Committee to Develop Guidelines on the Management of Adults With Congenital Heart Disease). Developed in Collaboration With the American Society of Echocardiography, Heart Rhythm Society, International Society for Adult Congenital Heart Disease, Society for Cardiovascular Angiography and Interventions, and Society of Thoracic Surgeons. J Am Coll Cardiol 2008; 52:e143.